The Najdorf Sicilian is one of the most sharp, dynamic and popular openings that Black can play and is a firm favourite amongst the world's elite players, including world number one Garry Kasparov. From very early on, Black unbalances the game to a reach a position in which one can play for the win without exceptional risk. The soundness of the Najdorf has never been questioned, but some players can be put off by the ever-spiralling amount of theory amassed on this great opening. In Play the Najdorf, however, Grandmaster and openings expert John Emms condenses this mountain to produce a workable black repertoire against all of White's possible options. 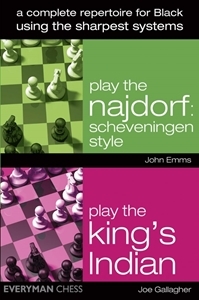 The King's Indian has always been one of the sharpest, most complex and popular openings that Black can play; it still provides the setting for many encounters at the elite level of Grandmaster chess. Straight from the start, Black fights for the initiative and in many variations, while White pursues material gains, it is Black who has the psychological advantage of trying to checkmate the opponent's king.